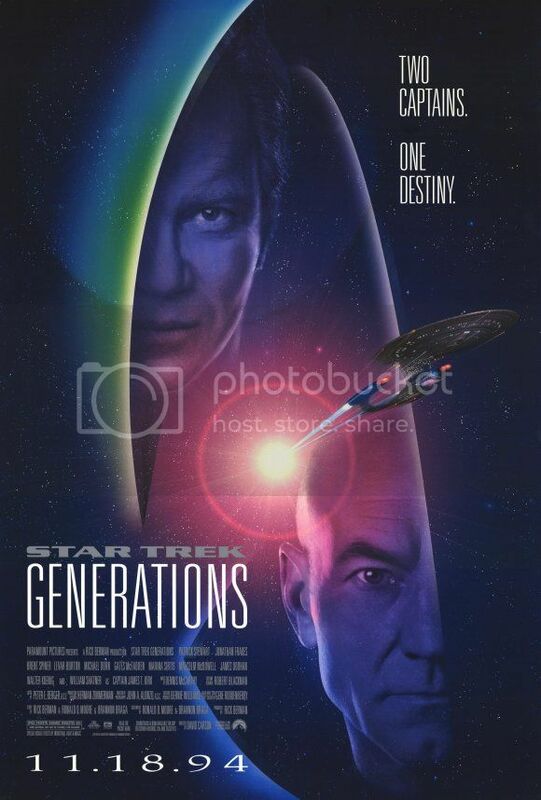 Star Trek: Generations exhibits all the fun of the zaniest of the Star Trek episodes - temporal nexuses (nexi? ), Freudian projections, ships crashing into planets - with the best of Battlestar Galactica's Ronald D. Moore - layered emotional complexity. We loved it! The story starts with an aging Kirk (William Shatner) - alongside crusty old favorites Scotty (James Doohan) and Chekov (William Koenig) - visiting the second USS Enterprise for its christening and first flight. At the helm is Cameron from Ferris Bueller's Day Off (Alan Ruck) - weird! - and, when Cameron was in Cameronland, let my Camerons go. That is, they encounter trouble (surprise). Trouble comes in the form of a rippling wave of temporal nexusness (nexilism?) - a big, sparkly blanket in space that destroys stuff. Kirk, helping to save the Enterprise, is blown out into the void. Mourning ensues. Eighty years later, Picard (Patrick Stewart) and his crew - on the Enterprise's descendant spaceship - run into some trouble with a broken science station and some marauding Klingons. It turns out Dr. Saren (Malcolm McDowell) is in cahoots with the crooked (and possibly lesbian? or were they twin sisters?) Klingon pirates to catch the next wave of nexus again. The nexus will make your wildest dreams come true! So the all-knowing Whoopi Goldberg explains. And Saron plans to hit that gnarly curl at the expense of an entire solar system, and this is something up with which Picard will not put! Other interesting emotional highs and lows are weaved in - a-motional android Data (Brent Spiner) gets a new emo-chip implanted into his circuitry, causing him to guffaw and weep and generally act ridiculous and hilarious; Picard suffers from a personal tragedy that makes him distracted and grieving. If it sounds slightly farcical, it's not - it works really well, since these themes (mortality making us human; the bittersweetness of that mortality; the courage in controlling emotions) are explored via diverse, believable experiences (well, sort of; cf. Data). Everything is also played relatively straight, which helps. They say that odd-numbered Star Trek films (such as this one) are categorically inferior to the even-numbered ones. While four and six are indeed the best Star Trek films we've yet to see, we actually preferred this one (which is seventh) to the more popular First Contact (which is eighth, and features the "The line must be drawn HEAH!" line). What can we say, we're suckers for the emo.